Though it may feel remote from the day-to-day pressures of running a real estate business, the overall economy plays a vital role in the local residential market. Real estate is a cyclical sector of the economy and one that’s dependent on a variety of factors. The job market, earnings and mortgage rates all come into play for consumers who are considering buying a home, as does the availability of desirable homes in areas that are attractive to buyers. Lately, the economy hasn’t been all that fun to watch. Wild stock market fluctuations in the final weeks of 2018, uncertainty over the impact of economic tariffs and a predicted drop in the gross domestic product are all a bit stomach-turning. However, while the economy is expected to slow in 2019, a drop into a recession is not in the vast majority of forecasts being released lately. Goldman Sachs anticipates that the rate of economic growth will drop from 2.9 percent to 2.5 percent. Additionally, the Congressional Budget Office expects the gross domestic product will grow by 2.4 percent in 2019, down from the 3.1 percent they projected for 2018. Nationally, rates on a 30-year, fixed-interest mortgage stand at about 4.7 percent, according to BankRate. In Chicago, rates currently fall between 4.4 percent and 4.8 percent. While the prospects of purchasing another home at a rate in the neighborhood of 4.5 percent can be daunting to homebuyers who last bought at 3 percent or so, the rate shock effect is not nearly as bad as it’s been in the past. Google and Amazon aren’t the only companies that have been impressed by what the Chicago metro area provides in terms of amenities, such as an effective public transit system and easy access to two major airports, and these conveniences improve the economic picture as far out as Fox Valley. 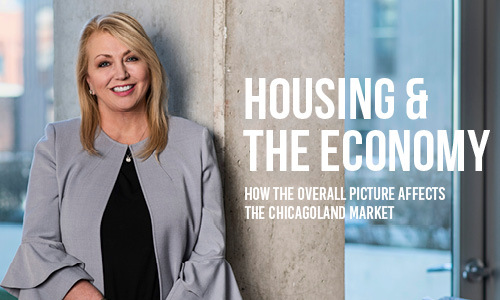 Debora McKay, team leader at @properties in St. Charles sees reasons for optimism in the number of companies relocating to Illinois, and to the Chicago area in particular. These commercial moves impact the residential market too. Downtown core areas are particularly attractive to employers because they’re centralized. This interest drives homebuyers to look for properties with easy access to those areas, near transit corridors that can get them there relatively quickly and efficiently. Inventory remains tight across the nation, though modest increases are expected this year. In its 2019 National Housing Forecast released at the end of November, realtor.com forecasted that prices will grow at a 2.2 percent rate and inventory will increase at a rate below 7 percent. However, most of that growth is expected to take place at the upper end of the market. Smith says that one factor contributing to the depressed supply at more affordable levels is the presence of real estate investors who are snapping up lower-priced properties. Those investors had previously taken advantage of the huge inventory of foreclosed properties on the market. In the Chicago region, growth is expected to backslide. Realtor.com’s forcast predicts that sales will decrease by 7.4 percent and prices will drop more modestly, by about 1.9 percent. But McKay is concerned about how economic volatility and the combative nature of national politics may have a dampening effect on home purchases in the region, particularly following fluctuations in the stock market and leading into the 2020 presidential election. “The challenge is getting these Midwesterners to feel comfortable. There are plenty of people who could buy and move around but I think a lot of people are just taking the wait-and-see method,” she says. Chicago has experienced a significant jump in luxury housing prices in recent months. According to Redfin, prices for luxury homes in the city rose by 19.2 percent in the third quarter. Meanwhile, most signs point to a continuation of the inventory shortages that have been plaguing the lower end of the market. In ‘Opportunity Zones,’ Do Residents Benefit?